The 10 Events You Need To Know To Understand The Almost-Firing Of Robert Mueller Everything about this story revolves around obstruction of justice — an allegation of wrongdoing reportedly under investigation by DOJ special counsel Robert Mueller that President Trump has denied. Robert Mueller is sworn in on Capitol Hill, prior to testifying before the House Judiciary Committee in 2013. President Trump's reported order last summer to fire Justice Department special counsel Robert Mueller is all about obstruction of justice — whether it happened, and whether it could be proved. Trump ordered White House counsel Don McGahn to fire Mueller in June, as The New York Times reported on Thursday. McGahn refused, and threatened to quit. Trump backed off. Speaking to reporters Friday at the World Economic Forum in Davos, Switzerland, Trump dismissed the report. "Fake news. Fake news," the president said in brief remarks as he entered the conference hall. "Typical New York Times. Fake stories." And prior to leaving for Davos, the president had told reporters he was willing to talk to Mueller's investigators under oath. Trump said he was "looking forward to it." At the time, the president also said, "There's been no collusion whatsoever. There's no obstruction whatsoever." Former national security adviser Michael Flynn is at the center of the Russia imbroglio. In January 2017, Flynn separately tells soon-to-be Vice President Mike Pence and FBI investigators about conversations he had with then-Russian Ambassador Sergey Kislyak earlier in the presidential transition, saying that the conversations were not related to U.S. sanctions on Russia. Pence goes on TV and repeats those claims, but the FBI, which was monitoring the Russian ambassador's communications, knows they aren't true. Flynn has since pleaded guilty to lying to the FBI and is cooperating with Mueller's investigators. On Jan. 26, then-acting Attorney General Sally Yates meets with White House counsel McGahn to warn him the Justice Department has evidence, via the FBI surveillance, that what Pence was saying publicly was inaccurate. She adds that because Russian diplomatic and intelligence officials also knew about the content of the conversations — and probably had their own proof of them — Flynn was vulnerable to blackmail. "To state the obvious, you don't want your national security adviser compromised by the Russians," she later tells Congress. Four days later, and after a second meeting between McGahn and Yates, Trump fires Yates. The reason given by the White House is her decision to instruct Justice Department attorneys not to defend his immigration restrictions. But subsequent events raise the question about whether Yates' dismissal also was connected to the unwelcome visit she paid to McGahn. Either way, McGahn told Trump that Flynn had probably provided an inaccurate portrayal of events to FBI investigators, according to Trump lawyer John Dowd. On Jan. 27, President Trump arranges a dinner with then-FBI Director James Comey, where, according to Comey's testimony before the Senate Intelligence Committee, the president says: "I need loyalty, I expect loyalty." Comey said he felt like the dinner was an effort on the part of the president to have him ask for his job and "create some sort of patronage relationship." Trump has denied asking Comey for a loyalty pledge. Meanwhile, the spin cycle continues to churn about Flynn's discussions with Kislyak, accounts of which were leaked to the Washington Post. About two weeks later, on Feb. 13, Trump fires Flynn. The very next day, according to Comey, he visited the Oval Office for a meeting with Trump and advisers. Afterward, the president cleared the room of everyone except him and the FBI director. "I hope you can see your way clear to letting this go, to letting Flynn go. He is a good guy. I hope you can let this go," Comey says Trump said. Comey says he would not agree to let it go. Trump has continually denied that he ever asked Comey to stop investigating Flynn. 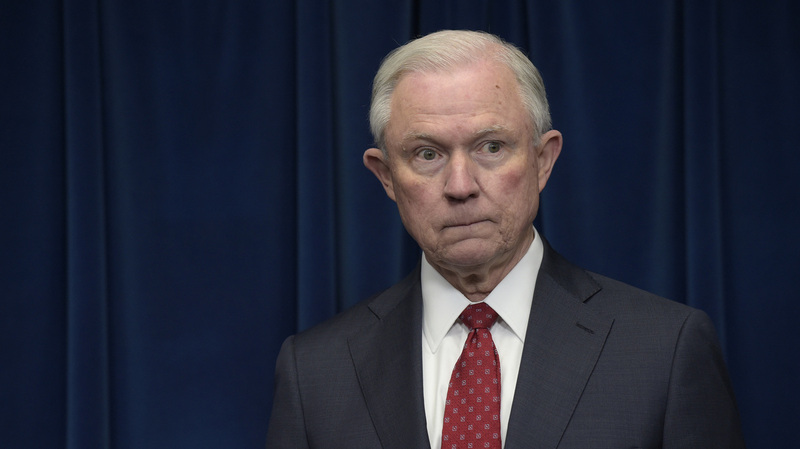 Attorney General Jeff Sessions waits to make a statement at the U.S. Customs and Border Protection office in Washington in March 2017, days after recusing himself from the Justice Department's Russia investigation. In March 2017, Comey worked for Jeff Sessions, the attorney general and the head of the Justice Department. But public pressure was building for Sessions, who worked much of 2016 as a senior adviser to the Trump campaign, to recuse himself from the Justice Department investigation into whether the Trump campaign was connected in some way to Russia's attack on the presidential election. Behind the scenes, Trump gave "firm orders" to White House counsel McGahn to lobby Sessions not to recuse himself, because the president expected his top law enforcement official to "safeguard" him, according to The New York Times. Meanwhile, Sessions was exploring ways to try to dirty up Comey in the press. He instructed aides to ask compatriots if they had anything that would make the FBI director look bad; Sessions reportedly wanted one negative story per day. The Justice Department denies that. Trump's efforts, at least, didn't work, and Sessions indeed recused himself on March 2, handing over the reins of the Russia investigation to his deputy, Rod Rosenstein. Trump, furious, upbraided the attorney general — but did not accept his resignation when offered. About three weeks later, in mid-March, Trump has a private meeting with Director of National Intelligence Daniel Coats and CIA Director Mike Pompeo. Trump asks Coats to intervene with Comey to get the FBI to "back off its focus" on Flynn in regard to the Russia investigation, according to The Washington Post. Around the same time, Trump calls Coats as well as National Security Agency head Adm. Mike Rogers to see if either would put out a statement publicly denying that there is evidence of any coordination between the Trump campaign and Russia. Neither will comply. The spokesman for the Office of the Director of National Intelligence, however, released a statement in response to the Post's reporting, saying Coats "never felt pressured by the president." And Rogers told the Senate Intelligence Committee in June of last year that in his three years as director of the NSA, "to the best of my recollection, I have never been directed to do anything illegal, immoral, unethical or inappropriate." On May 9, Trump fires Comey, saying in an interview two days later that the FBI director was a "showboat" and a "grandstander." Trump also mentions the FBI's Russia investigation, which Comey was leading — "this Russia thing," as Trump calls it. A "meandering" letter was drafted at the time by the president and a top aide explaining the firing, according to the The New York Times, but was never sent. It's unclear what the letter said, but White House counsel McGahn successfully blocked Trump from sending it, giving an indication that it may have included "problematic" details about Trump's motivations for the firing. After a public firestorm over the Comey firing, Deputy Attorney General Rosenstein appoints Robert Mueller to handle the Justice Department's Russia investigation as a special counsel on May 17. 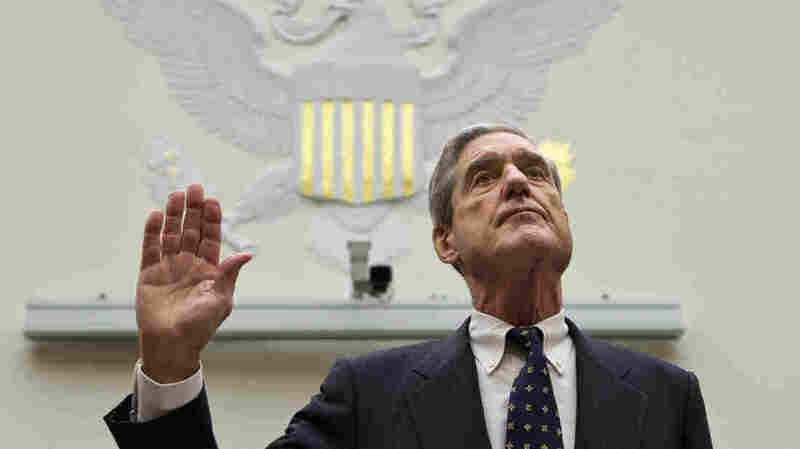 Mueller, a registered Republican, led the FBI for 12 years prior to his appointment, from 2001 to 2013. "The fact that some are playing politics does not mean that he'll cease being law enforcement," said former Attorney General John Ashcroft at the time Mueller was appointed. "Frankly, the barking dogs or the clamor of politics won't affect what he does." Don McGahn leaves the Four Seasons hotel in New York in June 2016. 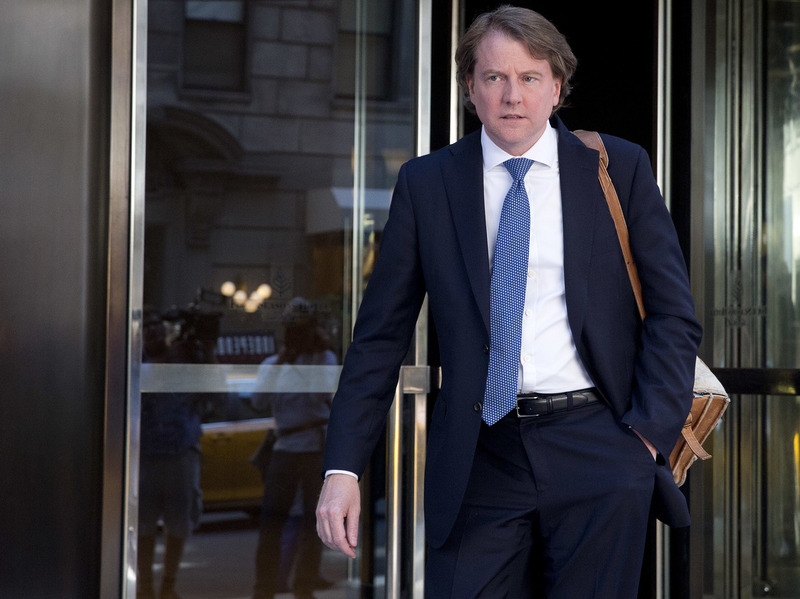 McGahn reportedly threatened to quit his job as White House counsel last summer when President Trump ordered the firing of special counsel Robert Mueller. In mid-June, news is beginning to swirl for the first time that Mueller is looking at the president for obstruction of justice. This is significant: A person can commit obstruction without there having been an underlying crime to conceal. So even if, as Trump maintains, he and his aides did nothing wrong and did not conspire with the Russians who attacked the election, they still could be in trouble over the actions that culminated in Comey's dismissal. So Trump tries again to remove the top leader of the Russia investigation — this time, Mueller. He lists three different reasons, and orders McGahn, the White House counsel, to fire Mueller. McGahn however, disagrees with the president's case and threatens to quit if Trump goes through with it. The president backs off the request; this week, he calls the reporting about the incident "fake news." At the time, however, on June 12, Newsmax Chief Executive and Trump confidant Christopher Ruddy told PBS that he thought Trump was "considering perhaps terminating" Mueller. Mueller's investigators could be looking into more potential obstruction beyond the president's desire to be rid of Comey and Mueller. For example, on July 8 aboard Air Force One, Trump dictated a statement about his son's now-famous Trump Tower meeting. In this version, the meeting was not about the 2016 campaign. But it has become clear in the time since that Donald Trump Jr. took the meeting under the impression it would lead to compromising materials about Trump's opponent, Hillary Clinton. In the months since Mueller's almost-firing, the Trump White House has taken a noticeably different tone about the Russia investigation. While Republican allies have continued to work to undermine its credibility, the White House itself has also touted how cooperative it is being. "The cooperation and transparency are unprecedented," attorneys for the president wrote, in releasing a list of information they have turned over. Trump said on Wednesday that "there's no obstruction whatsoever" and that allegations being misinterpreted as obstruction were just him defending himself. As Mueller looks over this timeline of events, however, attorneys say it may not matter how many reams of documents the White House provides happily or whether Mueller was actually fired. "Attempted obstruction is obstruction," constitutional lawyer and Harvard Law School professor Laurence Tribe told Washington Post columnist Jennifer Rubin, "even when the perpetrator backs down after failing to get his consigliere to do the deed for him." If Trump Sought To Fire Mueller But Didn't, Does That Mean Mueller's Safe Now?